Open up a newspaper, visit your favorite news Web site or turn to any local news program, and you'll see that Charlotte and the surrounding area is experiencing joblessness that borders on historic. According to the latest figures from the North Carolina Employment Security Commission, the jobless rate in the Charlotte metro area is 10.2 percent. Last year, Mecklenburg's rate of unemployment was 5.2 percent. Though there are signs of a slow economic turnaround statewide, the Employment Security Commission reports that Mecklenburg County is still hurting. "The five counties receiving the highest amount in unemployment insurance benefits in April were: Mecklenburg, $23.7 million; Wake, $18.5 million; Guilford, $11.6 million; Gaston, $8 million; and Forsyth, $7.5 million," the commission reports on its Web site. But for each figure, each announced group of layoffs and bankrupt companies closing their doors, there are real people who are left to pick up the pieces and continue living without a job. Bills keep coming, families continue to grow and life goes on. How can you survive when there isn't the prospect of another job around the corner? How do you put food on the table for a family that still has to eat? 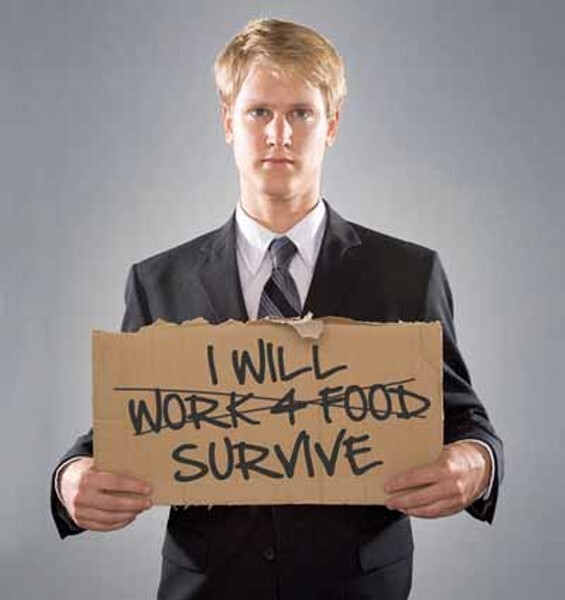 For those without jobs, they do whatever it takes to survive and provide. Creative Loafing found a few unemployed workers to share their plight and reveal how they are surviving without a steady paycheck. Tony Wright takes care of his three grandchildren, has to keep gas in his truck while he's searching for a new job and stay current on his insurance. "I've been going out with the day laborers. It's getting somewhat better; the work is picking up a little bit. It's better than it was [a few] months ago, I can tell you that. I was first laid off in April 2008. I worked at Omni Systems. Business was down and [the owner] moved his company two counties away. To be right honest about it, he started hiring ... immigrants who will work a lot cheaper. I was working for them for three years. I got unemployment for six months. I have three grandchildren that I take care of and if it wasn't for the ministries and Christian organizations, I really would have been lost. They help with rent, food, clothes and gas. They paid my truck insurance for two months for me." But Wright isn't just living off charity. The HVAC (heating, ventilating and air conditioning) certified technician would do any job, despite the fact that he's qualified to do much more. "I've helped people move furniture. I've done oddball paint jobs for people, and I'm HVAC certified. I've got skills, but they just ain't coming in handy right now. I've been buying clothes and food, just the basic necessities that my grandkids need. Our relatives will slide us something every now and then to help us out. I've learned not to take the future for granted ever again. I will save money, and I will not spend on things at Wal-Mart, at Home Depot. I will go out and do as much as I can for myself. I go out and see where people have put furniture out beside the road and recycle it. Stuff like that. I have to be positive. I pray every day and [stay] positive. That's the only hope that I have." Local college student Abdul-Aziz Davis has been down before. He was homeless at 13, so losing his job wasn't the worst thing that he's ever dealt with. Still, his loss of income may affect his education if he can't come up with money to pay his tuition. "I stayed with my grandmother in Durham and two years ago, I was working as a waiter. The manager from Circuit City came in, and I served him. He told me that he really liked the way I approached him and that I should come by the store and put in an application. He also said they had promotions for college students as far as scholarships. I never went and he came back a second time and asked why didn't I come to apply. After that, I applied online, and they called me in for an interview. They first started me off in the warehouse, loading up things. I told them that I wanted to sell because I was always good at communicating. I had taken a year out of college to work. When they put me on sales, I made high numbers and saved money to come back to school." Davis was making $12 an hour, working as many hours a week as he could. When he had enough money to pay for college, he returned to Charlotte and enrolled at Johnson C. Smith University. He also transferred to a local Circuit City, not knowing what was about to come around the corner.